You've found the “U.S. 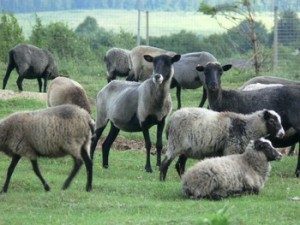 Romanov Sheep Breeders” page here at Hobby Farm Wisdom! If this is the first time you have visited our site: Welcome! Romanov is a breed of sheep native to Russia that has been raised primarily for meat after being noticed in the 18th century. This breed is especially adaptable to the cold inland climate. While they are purely black at birth, they quickly change to a gray color as they get older. Romanov sheep have a reputation for their exceptionally early maturity, reaching it at 3 – 4 months and breeding any time after that. Romanov sheep are excellent mothers, with quadruplets or higher being considered normal litters. The Romanov record is nine live lambs in one litter. The wool from a Romanov is very strong and typically gray and black. It is used for rugs, wall hangings and mats.